It’s starting to feel a lot like Christmas! 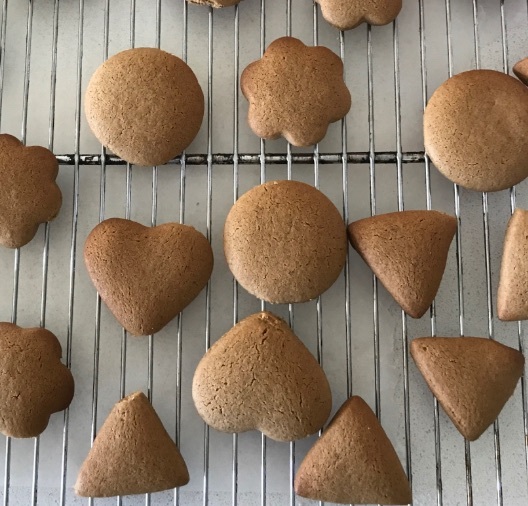 Especially with the warm, spicy smell of freshly baked gingerbread cookies filling my kitchen! Yum! 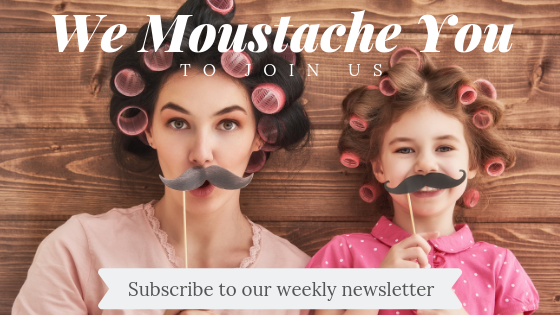 As I mentioned last week, Bubble and I spent a ridiculously long time in Cheap as Chips the other day, looking for gift ideas and checking out their art and craft supplies. 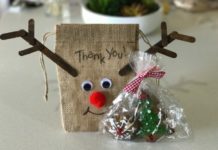 With so many special people to say a special Christmas thank you to this year, I figure we’ll need to get creative in order to stick to the budget! 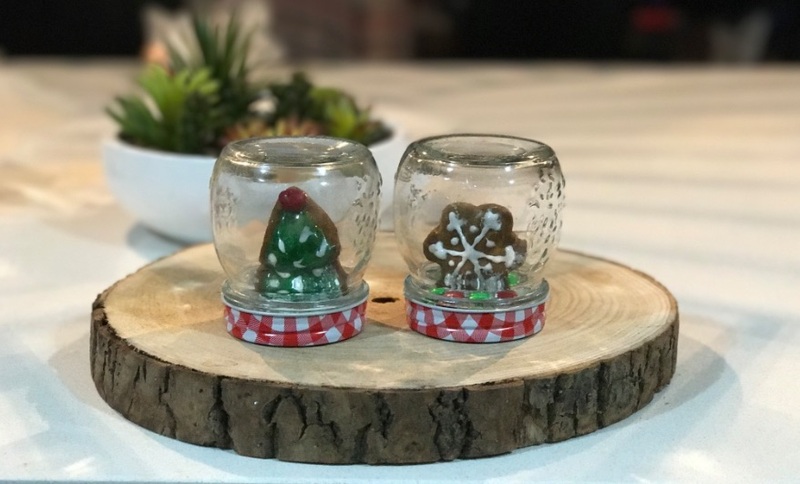 I’ve got a few ideas in mind that I’ll be sharing with you over this week, but my favourite are these super cute (and easy) gingerbread cookie snow globes. 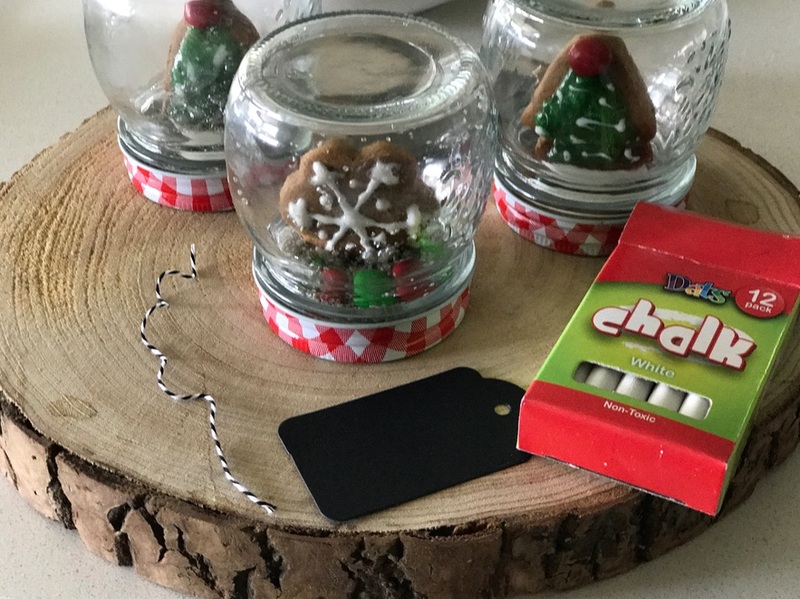 Sometimes, all you need are some cute (super cheap) craft supplies to bring an idea to life! 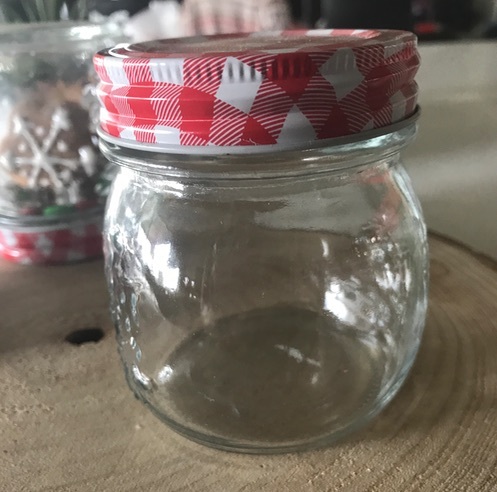 As soon as I saw the little jars with the red gingham lids ($1.50 each), I knew EXACTLY what I wanted to do with them! 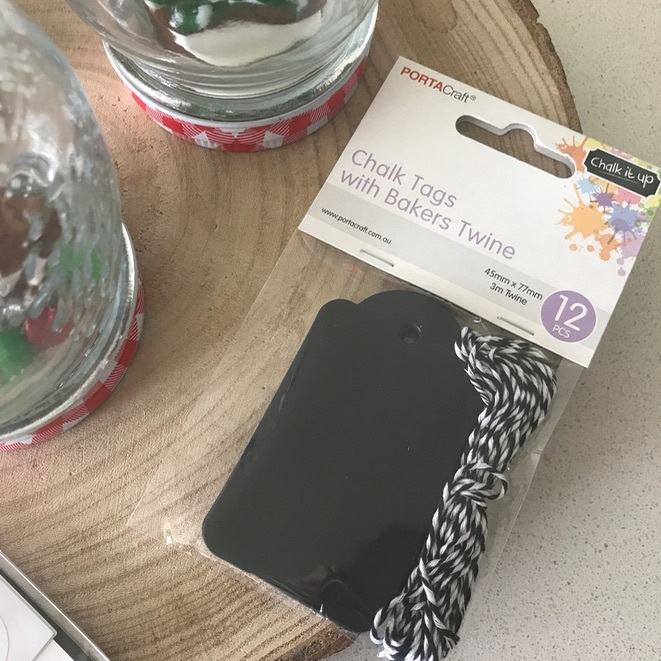 What about these gorgeous little chalkboard tags ($2 for a pack of 12). 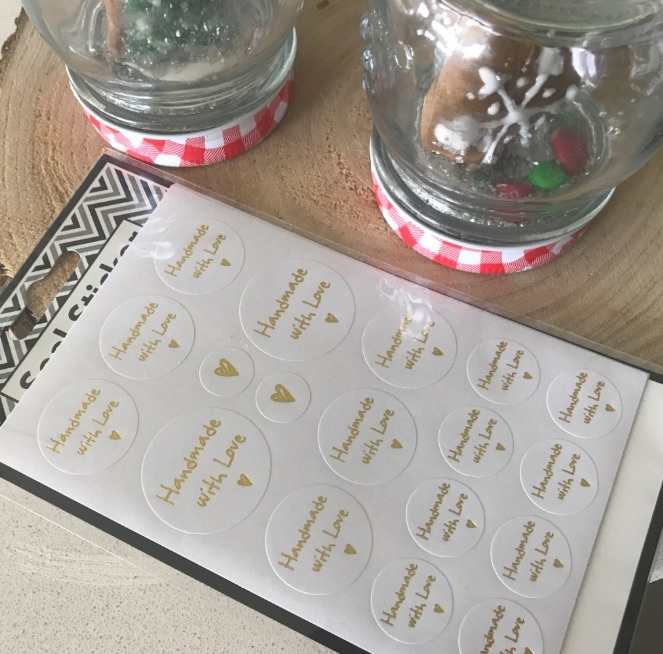 I also couldn’t resist these ‘handmade with love’ stickers ($2.50) for the finishing touch. I was like a kid in a sweet store! They have so much really cool, really cute things. I can’t wait to show you later this week what else we made this weekend! Anyway…without further ado, let’s get on with the how to! Chop butter into small cubes and then melt with the brown sugar and golden syrup tin a saucepan. Stir continuously until smooth. Allow to cool slightly. Whisk egg and butter mixture in a large bowl. Sift flour, spices and soda over the butter mixture, mixing and adding more flour as you go until a smooth dough is formed. Cover the dough with cling wrap and refrigerate for 1 hour. This allows it to become firm and easy to roll and cut shaped in. Flour a surface, and roll dough out to approximately 1/2 cm thickness. Using your cookie cutters create your biscuits. 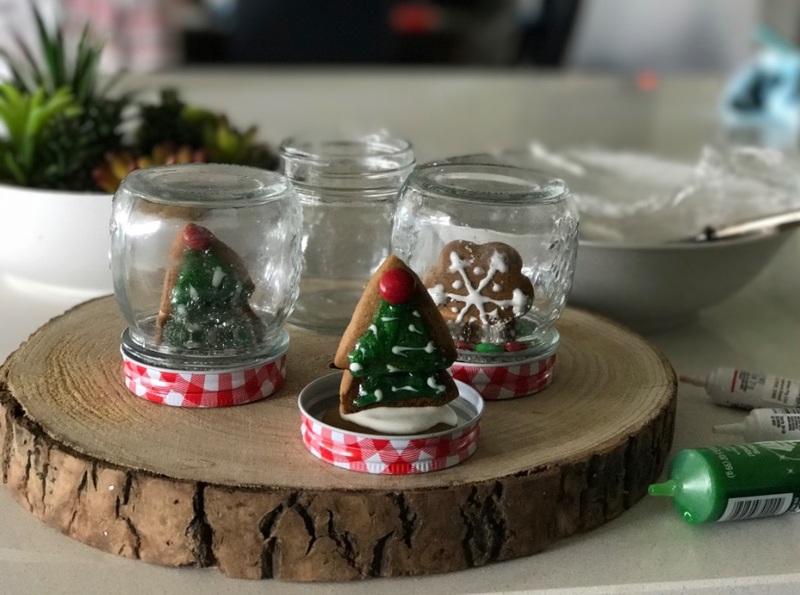 You will also need a small round cookie small enough to fit into the lid of the jar to mount your Christmas cookie on. Line baking tray with baking paper and place your cookies at least 1 1/2 cm apart (incase of spreading when cooking. Bake at 180C for 8-10 minutes until lightly browned. Transfer to a wire rack to cool completely before decorating. While you are waiting for your biscuits to cool, you can get the Royal Icing ready. This will be the edible glue you’ll use to stick your bikkies together. Beat an egg white until white and foamy and then gradually beat in the icing sugar. Cover this with cling wrap until you are ready to use, to prevent it from hardening. 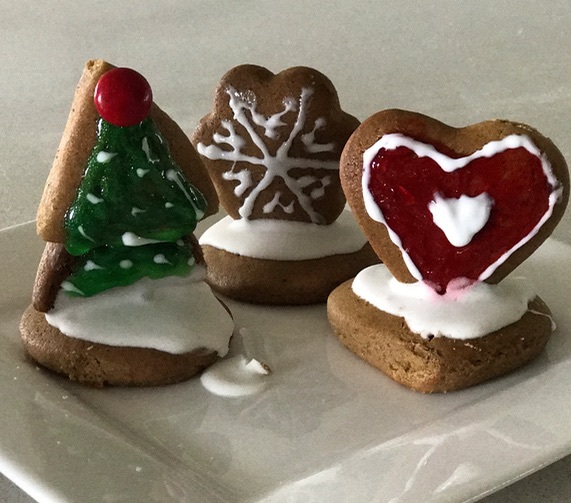 Decorate your cookies using the icing pens. 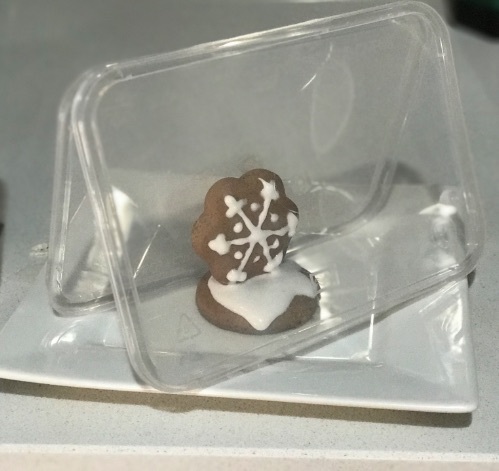 When your cookies decorations are dried you can use the royal icing to stick your cookie to its stand. I used two container lids to prop up the cookie while it dried. Allow to set for 1-2 hours. Using the Royal Icing stick the base of the biscuit into the inside of the jar lid. 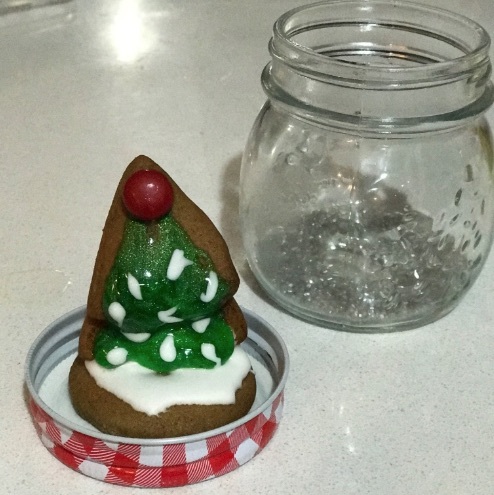 Add some edible glitter to the jar and carefully screw the lid on. (Make sure that your Royal icing has dried before you complete this step. 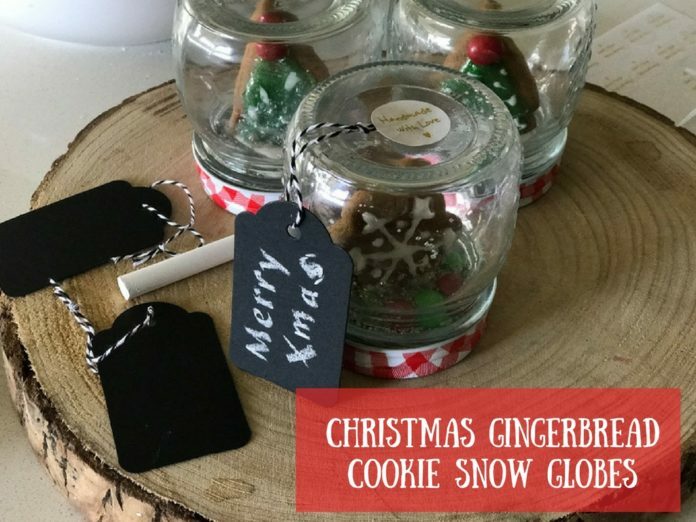 Now all that is left to do is add your name tags, and your Christmas gingerbread cookie snow globes are ready to be given to the lucky recipients. My kids are very excited to take them in to give to their teachers tomorrow! We also had lots of gingerbread cookies left over to decorate and enjoy at home. They really do smell and taste amazing! 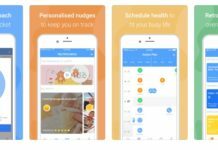 Previous articleBudget Christmas Gifts Under $15 You Didn’t Even Know You Needed Until Now! Next articlePersonal Trainer And Instagram Star Emily Skye Gets Honest About Her Pregnancy Weight Gain!